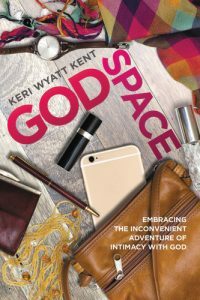 Home/Authors, blog, books, Keri's Soul, pace of life, sabbath, spiritual formation/GodSpace for Groups! I’m super excited to let you know that the long, careful writing and editing process for GodSpace:Embracing the Inconvenient Adventure of Intimacy with God is finished! This baby goes to the printer today. The editing team at FaithWords has been absolutely fabulous to work with. What an amazing team. It takes a village to complete a book, friends–and I’m grateful to have found such a wonderful one! GodSpace is available for pre-order now! And it takes a village to read a book, or at least really dive deep into it. I mean, if you’re going on an inconvenient adventure, wouldn’t it be better to have a few friends to join you? (Including me!) And if you read GodSpace with a group, you’ll get some fun freebies (keep reading to learn more). It’s so hard to connect with God in the midst of our busy, hectic lives, isn’t it? If you’re longing for more of God, if the pace of your life feels frazzled and hectic–I wrote this book for you! Some of you have already pre-ordered–thank you! Pre-orders matter so much in today’s publishing world–so if you want to get a copy, please don’t wait for launch (which happens September 5!). Order now. If you’re not in a group, I still hope you’ll pre-order. I’m cooking up some other incentives for groups and individuals, so hey–let’s keep in touch. Jump to the right and fill in that “subscribe” box so we can be email pals and you don’t have to miss a post about GodSpace, and about living the adventure of intimacy with God. Order GodSpace from Barnes&Noble.com or your favorite bookstore or online retailer. If they don’t carry it, ask them to order it! How do I preorder and get goodies for my group?! I and a group of my girlfriends are planning a God Space study group and am wondering where we can buy or download the study guide? We are very excited to start this! Shelly I’m delighted to hear about your group. I will email you a PDF of the study guide. We’re working on website revisions to make it available here on the site, but for now I’m glad to email it to you. IF your group members would be so kind as to post amazon reviews on the book after they read it, that would be awesome! Look for an email from me. My small group would like to do a study of God Space. Is there a study guide available? Hi Ashley, yes there is a study guide. If you simply hang out on the website for a few minutes, a box pops up asking you to subscribe and get the free study guide. That’s the easiest way to do it. Or go to my blog (on the website) at http://keriwyattkent.com/blog/ then scroll down and you’ll see that same box on the right side. Just put in your email address and you’ll get the study guide for free. Also, if you’ve purchased books, and would like signed bookplates from me to put in the books, just let me know and I’ll be glad to send them to you. Comment below if you’d like me to email you about that. Enjoy your group!